Set in two acres of rolling countryside, The Little House on the Corner is fully equipped to ensure that your holiday is truly memorable. Private garden with a decked, furnished patio and BBQ. Comfortable furnishings with attention to detail. Wood burner to warm the gite during cooler periods. Two bedroom gite in the Dordogne accommodating up to 6 people plus cot. River bathing close by. Flexible start dates. Short breaks welcome. NEW FOR SPRING 2019 - PRIVATE ABOVE GROUND SWIMMING POOL SET IN TWO ACRES OF GARDEN. STUNNING VIEWS. Set in two acres of land, The Little House on the Corner is fully equipped to ensure that your holiday is truly memorable. NEW FOR SPRING 2019 - PRIVATE POOL SET IN TWO ACRE GARDEN WITH STUNNING VIEWS. STAND BY FOR PHOTOS!! 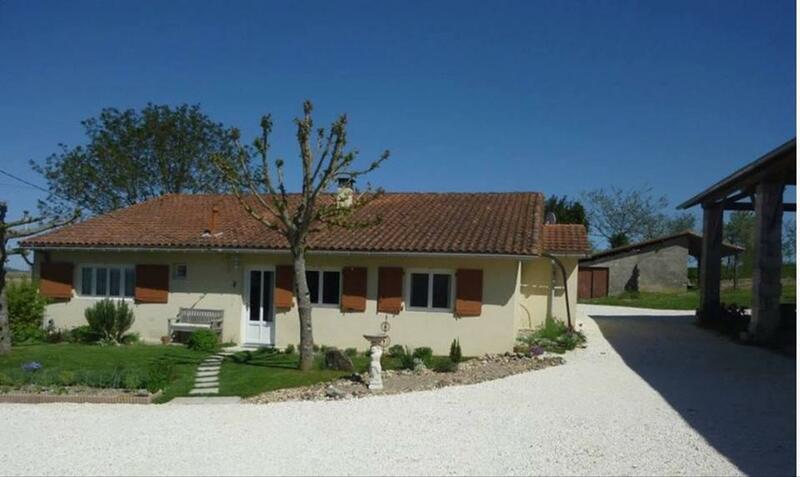 This is a great quality, two bedroom gite that sleeps up to 5 comfortably, with a travel cot provided where necessary. Set in peaceful rolling countryside with every modern amenity; a real home-from-home experience. The gite sleeps four people although six can be accommodated with an extra single bed and a cot. Bedrooms are large with king-sized beds and luxurious bedding. A hairdryer, straighteners, towels – all provided. The Little House on the Corner has a large salon, bright and airy with a contemporary feel, tastefully coordinated. A huge wood burner warms the gite during cooler periods. Comfortable seating and furnishings create a relaxing indoor experience and Freesat TV, DVD player/CD player, WiFi and more is available too. A private patio and garden for your exclusive use has a decked, furnished dining area and barbecue, with sun or natural shade available. Take advantage of the two acre garden! The setting is truly idyllic with 360 degree views. Our gardens are peaceful, attracting many species of wildlife and the evening skies are free from light pollution. You will be amazed at the clarity of the constellations visible to you as you unwind with an aperitif or verre de vin! Bergerac airport is less than 50 minutes away and the wonderful city of Bordeaux, with its huge airport, is just an hour. The gite is just 7 minutes from fabulous bathing at Aubeterre sur Dronne’s river beach, with canoeing, play area, boules and much more. It’s steeped in history as the 5th Official Beaux Villages en France! For your first evening, and indeed throughout your stay, why not try a freshly cooked, two-course meal with wine? All produce is home grown and meat locally sourced. Breakfast goodies such as fresh croissants, baguettes, condiments, juice etc can also be provided. Sleeps four people although six can be accommodated through an extra single bed and a cot. Bedrooms are large with king sized beds and luxurious bedding. A hairdryer, straighteners, towels – all provided. Flexible start dates. Short breaks available, please enquire. Wood burner available for cooler months.